The biggest movie of all time... be, will it? Well, there's certainly no shortage of records being broken this weekend as Star Wars: The Force Awakens' $238 million debut easily topples the previous record, Jurassic World's $209 million. Though, since these are still estimates, the margin of error could be millions off, and the numbers could end up higher. Overseas, The Force Awakens couldn't quite claim a record ($279 million)... behind Jurassic World ($316 million) and Harry Potter: Deathly Hallows Part 2 ($314 million). But to be fair, it didn't debut in the all the same places as those films. 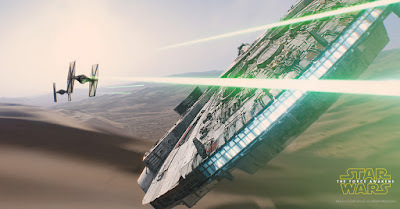 Worldwide, The Force Awakens has already grossed $517 million. First film to cross $100 million in a single day. Fastest film to $100 million and $200 million. Also, biggest opening in December, which was previously held by The Hobbit ($84.6 million). And, according to Holiday Season box office economics, could mean a healthy stay at for the next couple of weeks... with the potential to dethrone Avatar's $2.79 billion worldwide gross. But who cares about that movie, when there were two other debuts this weekend: Alvin and the Chipmunks: The Road Chip ($14.4 million) and Sisters ($13.4 million).